Six players, a handful of support staff, and deep sorrow are all that remain of Brazil's Chapecoense soccer club. They will still try to play again. Because they know that's what their 19 teammates who died Monday when a charter plane ripped into an Andean mountainside would want them to do. "In the memory of those who died and to honor their families, we will rebuild this club from scratch so it is even stronger," club director and local businessman Cecilio Hans said. "We had material assets and human assets. Now we've lost nearly all of our human assets." Other clubs in Brazil's top league are offering to loan players to Chapecoense, with a proposal that the modest club in deep southern Brazil is guaranteed to stay in the top division for the next three years. "The club will rebuild, I am sure," said Walter Feldman, secretary general of the Brazilian Football Confederation. "Eight clubs have already called me to offer concrete, material solidarity. We are studying ways to best help." The crash occurred as the team was on its way to the opening game of the two-leg Copa Sudamericana final — the No. 2 tournament on the continent. Only three players survived, and all are recovering at a hospital in Colombia: defender Helio Zampier, commonly known as Neto, defender-midfielder Alan Ruschel and goalkeeper Jakson Follmann, whose right leg had to be amputated Tuesday. 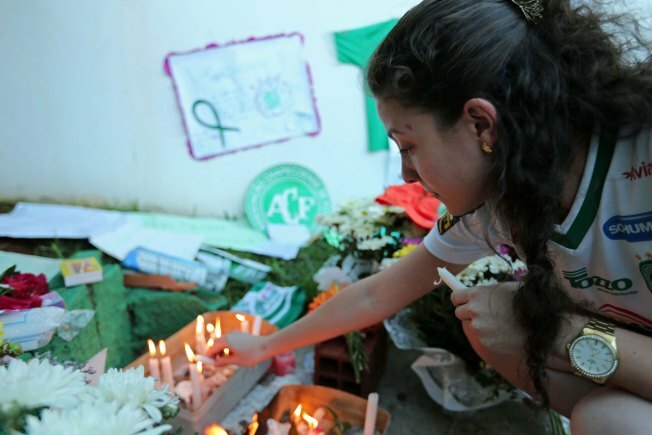 At the time they expected to be home watching their team on TV, more than 22,000 Chapecoense fans were at the Arena Conda to cheer, cry, watch videos of tributes coming from all over the world and attend a Catholic Mass. They celebrated the Copa Sudamericana title they hope to share with Atletico Nacional. They used a song created by Atletico fans: "May they hear/all over the continent/that we will never forget/the champions of Chapecoense." With the families of the victims on the center of the pitch, fans chanted the names of the players one by one and celebrated 5-year-old Carlos Miguel, the club's mascot that many in the city feared to be in the crashed plane. Dressed like a Chapeco indian, Carlos waved to the crowd in tears as the stadium's big screen showed messages like "heroes" and "forcachape" (be strong, Chape). The few staffers and players who didn't travel circulated the pitch as fans cheered. Chape, as the team is called locally, reached the top of South American soccer without any superstars — no high-profile players from Brazil's celebrated national team. It was in Brazil's fourth division just seven years ago, climbing into the first division by 2014. Now it starts the climb again, and this one is even steeper. 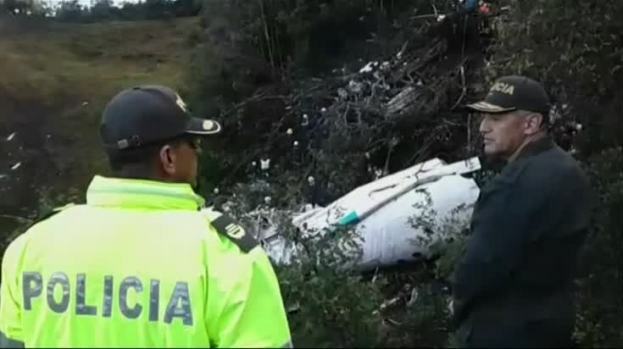 Seventy-six people are dead after a chartered plane carrying a Brazilian soccer team crashed outside Medellin, Colombia, while on its way to the finals of a regional tournament. Six people initially survived, but one of them later died in a hospital. Video from the scene shows police officers and rescue workers inspecting the wreckage of the chartered airplane that crashed in a mountainous area. Goalkeeper Marcelo Boeck said he and several players had deals to leave the club new one next year. He said they're reconsidering. "We know this is a different moment, and we are part of it," he said. "We hope we can help rebuild in the memory of our team." The rebuilding could start Dec. 11, the date scheduled for the final round of league matches in the top Brazilian league. Games have been called off this weekend for a period of mourning. Chapecoense's acting President Ivan Tozzo told reporters on Wednesday the club hopes to play that match against Atletico Mineiro using a primarily junior team. After that match, there is uncertainty over Chapecoense's future. If the team is awarded the Copa Sudamericana tittle —like its final opponent Atletico Nacional proposed — it would qualify for next year's Copa Libertadores, the Champions League of South America which begins in February. Chapecoense guaranteed its place in the Brazilian first division for next season, and it is also scheduled to defend its Catarina state title in the regional championship starting in January. Data analyst Victor Hugo, one of the key assistants to coach Caio Junior, who died in the crash, said very little remains. "We have a couple of doctors, two physiotherapists, two locker room staffers, one nurse, one masseur, one goalie coach and me," he said, speaking at Arena Conda. Hugo said the staff members and six players not selected for the big match in Colombia — some because of injury, others because of the coach's decision — are trying to cope with the tragedy. "That disappointment over not being chosen to be there was quickly replaced by that horrible mixture of grief, and with some relief just to be alive," he said. "That will stick with us forever." Argentine midfielder Alejandro Martinuccio was injured and didn't travel. He spent Tuesday answering concerned calls and comforting friends and family of the Chapecoense players. "I am not religious, so this is even more difficult," Martinuccio said. "I am so sorry that this beautiful story is going to end like this." Veteran goalkeeper Nivaldo was not selected so he could prepare for his 300th game with the club on Sunday against Atletico Mineiro in the last game of the Brazilian league season. After the accident, the 42-year old goalkeeper said he would retire immediately, but now he wants to play in the last game to honor his fallen teammates. "My teammates would want us to play that match," a teary and emotional Nivaldo said. "I just don't know how I could stand a full stadium with people calling the name of the players that died. We will have to try, I think. But that is going to be hard." One of the three surviving players was Jakson Follmann, the second-string goalkeeper behind starter Danilo, who died in the crash. Authorities in Colombia said they had to amputate Follmann's right leg, and he remains in the hospital. "I told Follmann I was going to stay here one more year to see him thrive," Nivaldo said. "He said he was going to carry me on his shoulders after my 300th game. That is not going to happen."